Intelligent Performance Management: It combines KPIs calculation, intuitive graphical visualization, dynamic targeting, deviation detection, and automated gap diagnosis. 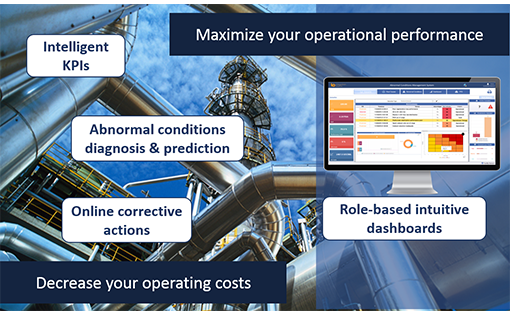 The refinery expert’s KPIs include leading and lagging KPIs that are tracked online to early detect performance deviations and to timely alert end users about the root cause behind the deviation and the action that should be taken to drive the process back to its normal operating mode. Abnormal Conditions Management: It focuses on the detection and prediction of the most critical complex events that may appear when operating the unit / plant. Abnormal conditions can vary in severity and consequences from off-spec product to catastrophic failure of equipment or unplanned plant shutdown. It combines the latest technologies in terms of rule based reasoning with advanced analytics algorithms applied on the unit historical data to come up with pertinent and accurate detection and prediction rules for the unit disruptions.